Traveling while making plant-based choices can be a little tricky and although I did some research ahead of our visit to Prague I didn’t know what to expect from the vegan options in the city. 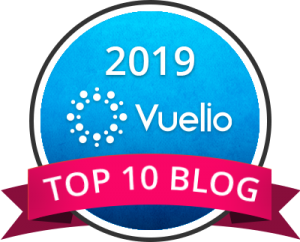 I was very pleasantly surprised though and after four days in the Czech capital we agreed we hadn’t had a bad meal and the food on offer was beyond our expectations. Even eating out in a big group of 16 hungry triathletes I could eat well! When I landed at the airport from Edinburgh and had an hour or so to wait for the others arriving from Heathrow I grabbed a fresh juice from Fresherie, a small cafe in Terminal 1 that does smoothies, juices and protein shakes as well as soups, salads and sandwiches. Our first meal in the city was lunch from Loving Hut – an international chain of vegan restaurants that served healthy vegan food buffet-style that you could choose from and pay by weight. I chose the falafel with a selection of different salads and it was tasty and fresh, the falafel in particular was well spiced and not too dry. Loving Hut, Level 1, Quadrio Shopping Centre. Open 8am-9pm. Lunch plate for 100 CZK. For dinner we met with the team from Berkshire Tri Squad and ate at the oldest pizzeria in Prague, Pizzeria Kmotra, which was super close to our Airbnb and perfect for big groups. The classic Italian menu had lots to offer, with small changes that could be made to accommodate lots of dietary requirements. They had gluten free pizza bases, lots of salads to choose from, wholewheat pasta and as I opted for, could remove the cheese from any veggie pizza to make it dairy free/vegan. Pizzeria Kmotra, Prague 1. Open 11am – 12am. Pizza/pasta for 150 CZK. Booking recommended for larger groups but restaurant space is large with bar upstairs. For breakfasts we ate in, making use of our kitchen in our apartment and prepping overnight oats, enjoying fresh fruit and nuts and making coffee. Every coffee shop we went to offered either soy or almond milk so it’s easy to get your flat white fix. 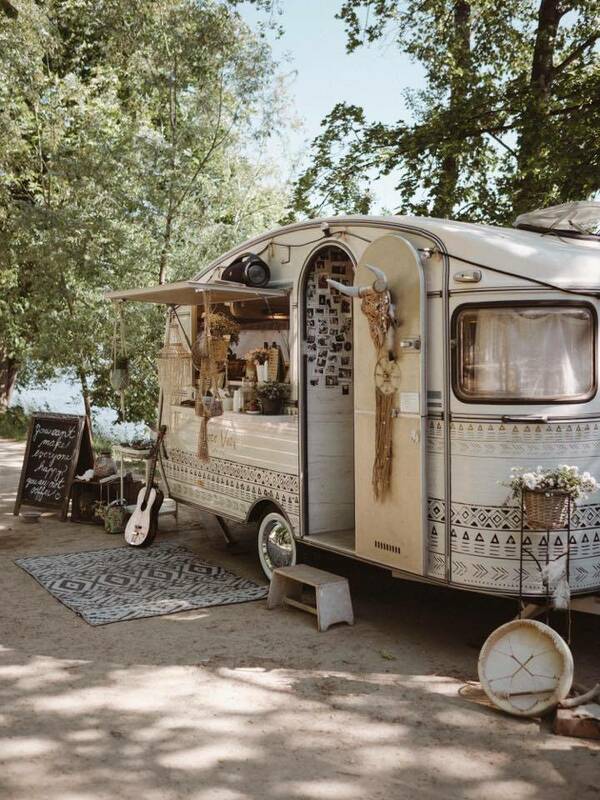 The Coco Van in particular was very cute – a little caravan tucked under the trees on the island serving great espressos with kooky seating around it to enjoy you cup – and perfect for pre-race coffee. Caffe Espresso, Prague 1. Open 7.30am-7pm. Flat white for 49 CZK. Kafe v Klidu, Prague 1. Open 8am-7pm. Espresso 25 CZK. Coco Van, Prague 1. Open 10am-9pm. Espresso 30 CZK. 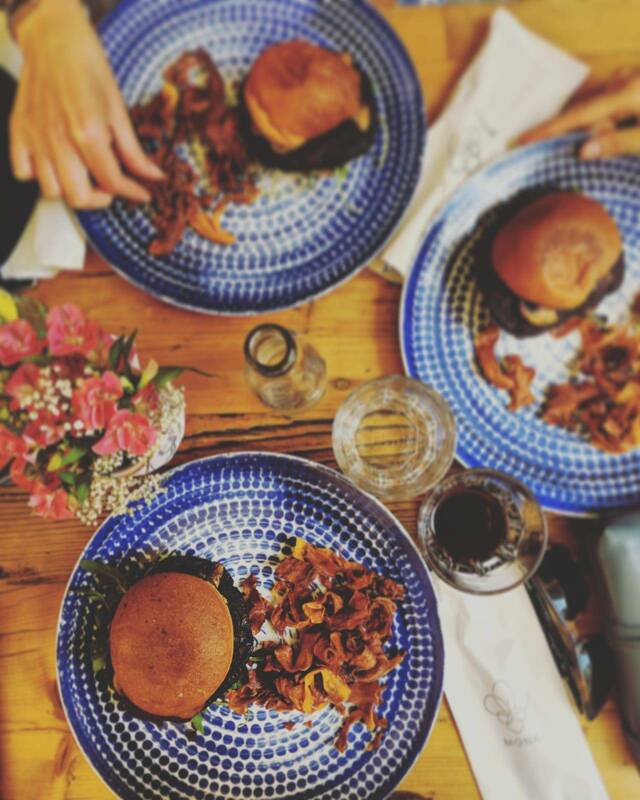 One of my favourite meals out in Prague was lunch with the girls at Bistro Monk, where we all chose beetroot burgers and sweet potato crisps (not fries, Steph’s served on a gluten free bun). As well as meat and fish dishes, there was also a vegan beef goulash on the menu that intrigued me, maybe next time. It’s a stones throw from the Old Square and clock tower, and there’s also a vegetarian restaurant and health food shop – Country Life next door, but I’d recommend sitting outside under the umbrellas and doing a bit of people watching while you enjoy your lunch. My dessert/treat recommendation is an ice cream parlour you HAVE to go to if you visit Prague, promise me! 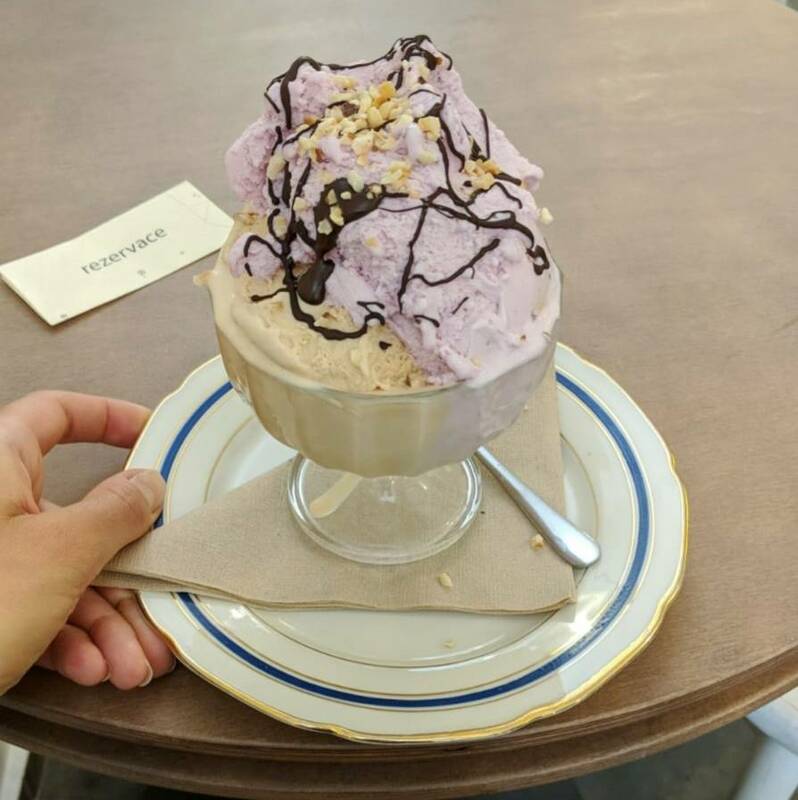 As well as some amazing dairy ice creams – tiramisu, Oreo cookie and dark chocolate-chilli – and sorbets – strawberry and thai basil, sea buckthorn and blueberry – the vegan ice cream options at Creme de la Creme were incredible. I tried the pistachio and coconut and both were bliss! Expect queues but they’re worth the wait! 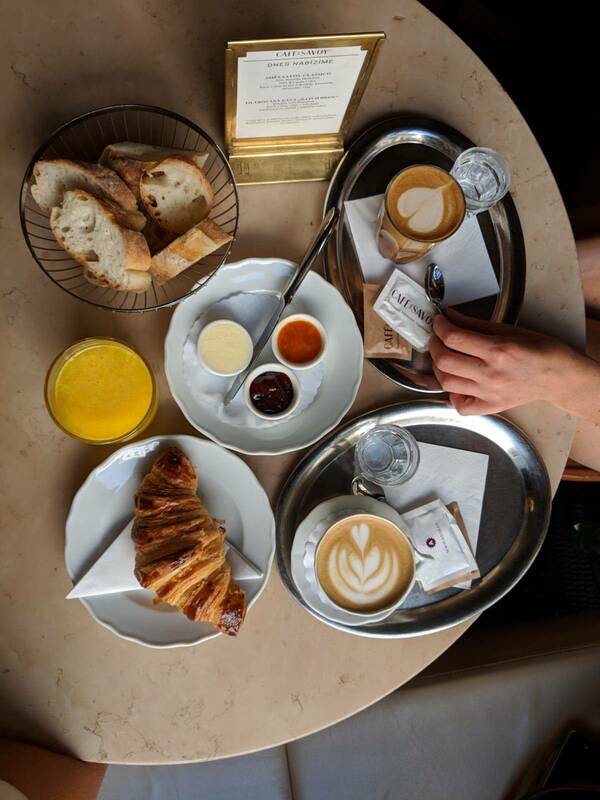 One last recommendation and our final meal in Prague – breakfast at Cafe Savoy. A beautiful space filled with marble, dark wood, gold trim and the highest of ceilings from which sparkling chandeliers hung, the food was pretty special too. They have their own patisserie, which you can have a nosy at as you visit the bathrooms downstairs, and serve up a great selection of classic brunch food and coffees. Steph and I shared the healthy breakfast and I ordered a side of almond milk (homemade I think) instead of the yoghurt to go with the granola, plus a great flat white and delicious fresh bread with apricot jam. Book a table and stay as long as you like!